This is my second versionof Simplicity 1716. I blogged about the first version here. This time around I used a heavier weight cotton jersey. I decided rather than doing a sway back adjustment I would make the bust and arms a size smaller, and go up a size over the hips. I think this has resolved the issue of excess fabric in the back. 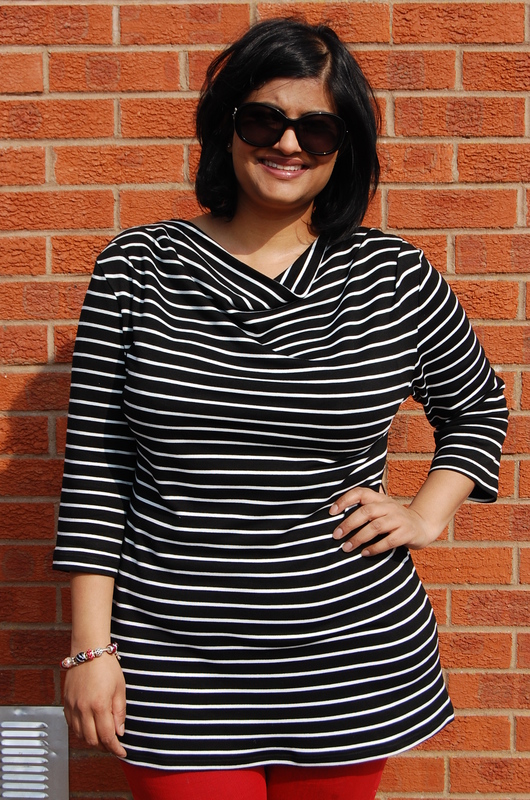 The first version of this top had a twisty neck detail. This version has a cowl neck. I do wish the cowl was perhaps slightly lower…if I make again I might try and adjust this. 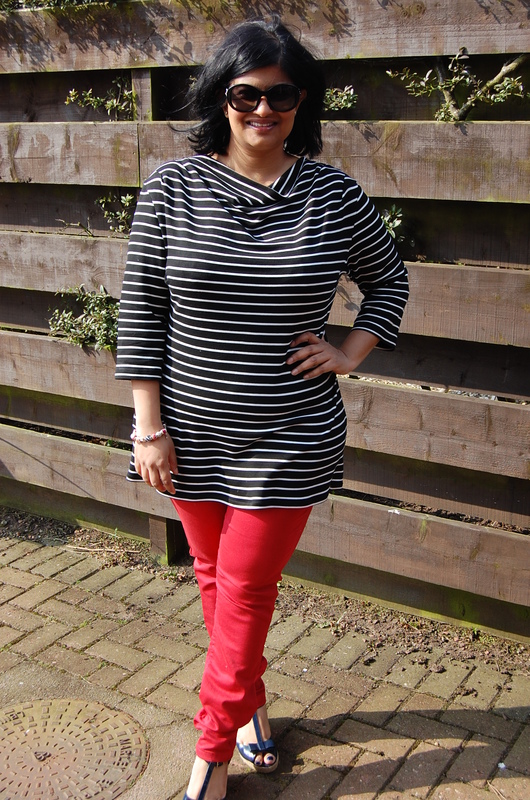 I also cut this version at the tunic length (mid length of pattern options). A much better length for me! Megan Nielsen Kelly Skirt + Simplicity 2365 Tunic Top = one mammoth post! I bought this pattern because of your first review, and now I like this second top even better. Looks great, especially with those red pants! Thanks Angela. Hope your versions turn out great. I liked the first top you made from this pattern, and I love this one. I’m seriously putting this pattern on my list of those I want. I quite like the higher cowl, but I’m sure it would look great lowered a bit too. Thanks Sam. Yes it definitely a winning pattern in my book! Here here, Blacklabel, another winner! 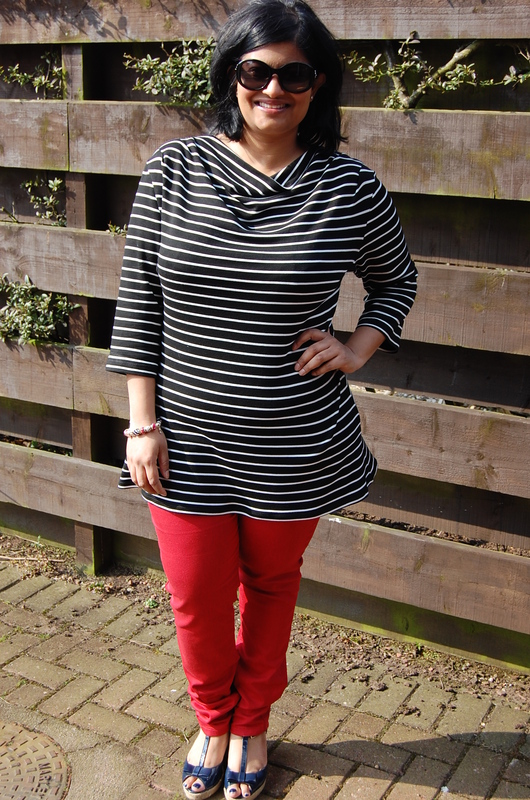 Ooh Manju, it really is a go to top…looks fabulous with trousers, got a comfy and incredibly nautically stylish vibe going on there. Perfect!